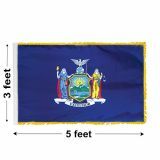 Our New York flags are designed to be used by government and commercial organizations and to handle the 24/7 use these entities require of them. We offer a full line of Commercial Grade flags that are sewn with heavy industrial thread, wide hems, Dupont UV resistant fabrics and inks, and produced on industrial, high resolution printing equipment. You'll find Polyester to withstand harsh windy areas, Nylon that fly well in light breezes, elegant, gold fringed indoor NY flags, and much more. You'll find the best prices and highest quality in the market. 100% Customer Satisfaction Guarantee. We accept Purchase Orders, Credit Cards, Checks or Paypal, If we receive your order by 4:00 EST, we'll ship it the same day. The official New York State Flag shows the state coat of arms on a blue field. The goddess Liberty on the left, and Justice on the right support a shield in which the sun rises over boats sailing the Hudson River. Tuff Flags focuses on Commercial Grade products. Our Commercial quality NY flags whether they're Outdoor or Indoor are made to be the best available. We back it up with a 6 month construction guarantee to give you extra assurance. In addition to our wide line of commercial products we know many of our customers would like New York flags to fly at home to support their favorite sports teams, use for temporary use, or even fly on a dorm wall. Whatever your use, we try to offer you the appropriate option. 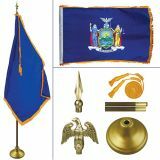 Browse our complete line of New York State Flags and choose the flag that matches your needs. Need tips to choose the best option? Call our toll free number (888) 287-3524 or email at customercare@tuffflags.com and we will assist you.